It’s the end of the week and I have a dinner idea for you that I think you’re really going to enjoy. 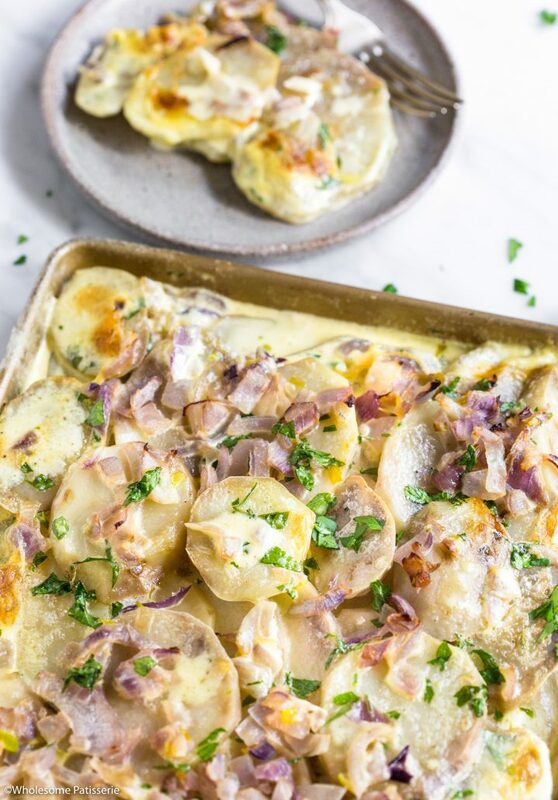 Well it’s more of a side dish but you can’t go wrong with potatoes and this is a classic, scalloped potatoes! Did you realise how easy scalloped potatoes were? If you haven’t made them for a long time well they deserve more of your time because not only do they require under 10-ingredients, they’re so full of flavour (probably that thickened cream!). 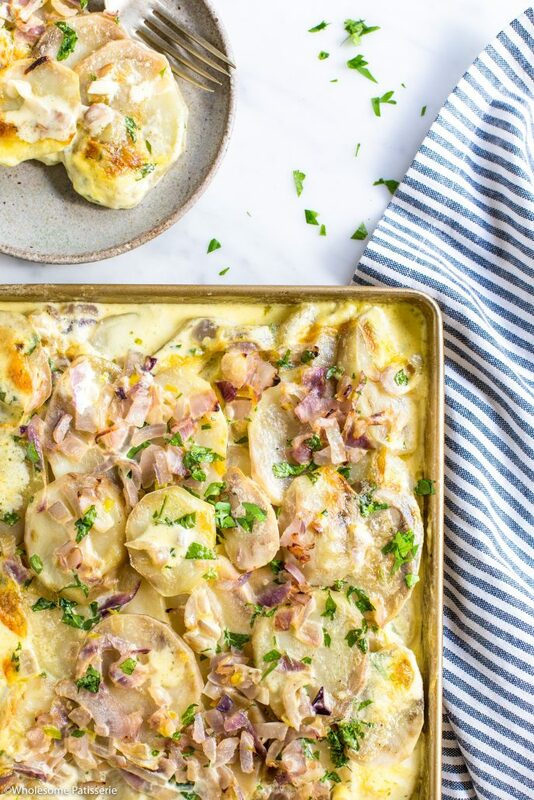 I served these scalloped potatoes with homemade pasties on the weekend. You can also serve them with veggies, rissoles, lasagne and much much more! If you don’t want to use thickened cream because of the dairy, you’re welcome to try full fat canned coconut cream. I haven’t tried this way myself but I’m sure it’s equally delicious! As for the parmesan, sub it out for your favourite dairy-free cheese! Have a fantastic weekend friends! 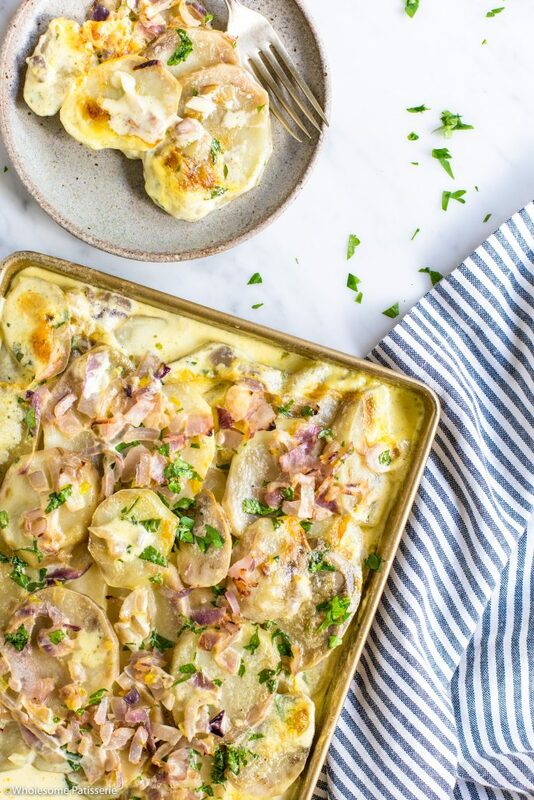 Hope you will be making these delicious scalloped potatoes?? Preheat oven to 200°C (400°F). Grease a large baking pan with sides, set aside. Heat oil in a small fry pan over med-high heat. Add chopped onion and sauté until soft and translucent, approx. 2-3 minutes. Remove from heat and set aside. Pour cream into a pouring jug and stir through parsley, nutmeg, salt and pepper until well combined. Slice potatoes into approx. 5mm (2cm) rounds. Arrange a layer of potatoes in greased pan and sprinkle over half of the cooked onions. Pour half the cream over the potatoes. Arrange remaining potatoes in another layer on top and sprinkle over remaining onions. Pour over remaining cream. Bake for 35-45 minutes or until potatoes are tender and golden. Remove from oven and sprinkle over grated parmesan, return to oven and bake for a further 10 minutes or until cheese has melted and golden.